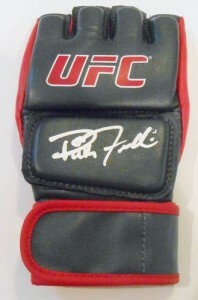 Rich Franklin's rise to UFC stardom has resulted in a tremendous following for his cards and autographed memorabilia. Franklin is a former UFC Middleweight Champion and is equally adept at winning by both submission and knockout. Franklin's trading card debut came in 2008 Donruss Americana II. 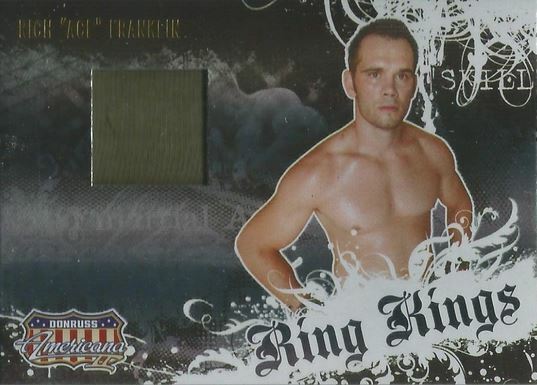 He has a total of seven cards in the product, all part of the Ring Kings insert set. In addition to the regular insert, Franklin has memorabilia, autographs and autographed memorabilia cards in the product. 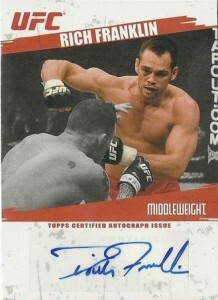 It is an ideal opportunity for collectors looking to own the first Rich Franklin cards of multiple types. 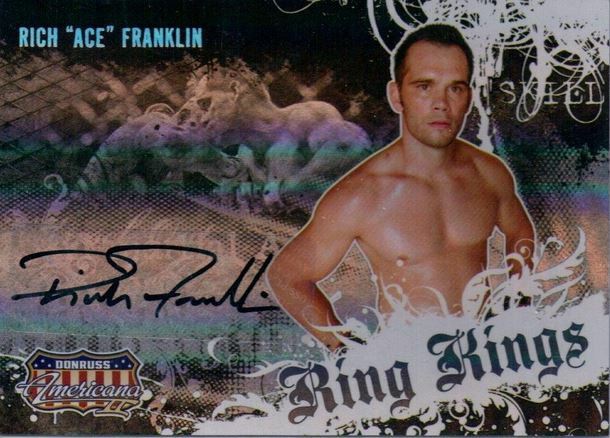 In addition, for a former UFC Middleweight Champion and potential contender, Franklin's autographed trading cards are a bargain. Franklin's punishment of UFC Champion Ken Shamrock in 2005 put him center stage on the UFC roster. His instantaneous credibility and dominance brought immediate collectibility to his autographed memorabilia. Despite having eventually lost the title, he remains in contention ensuring the values of his signed items. All of the cards from the Ring Kings insert set start with the same design and then add or subtract elements accordingly. Interesting to note is that the Signature Material card is easier to find than the material or autograph card on their own. At 500 copies, it has a significantly higher print run than the other two cards. In addition to the three featured below, a Directors Cut version (#/100) uses a cut signature instead of a sticker. Also, Prime versions of the Material card (#/25) and Signature Material (#/75) card were also produced. 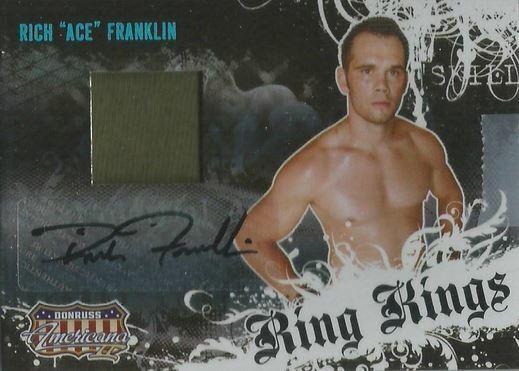 Franklin's first Topps autograph came in the company's second UFC set. Although the print run has not been released, it does sell for slightly more than his Americana Ring Kings autographs. Below you will find examples of what an authentic Rich Franklin signature autograph looks like. This can be used as a first point of reference for determining the legitimacy of autograph memorabilia, but is not a substitute for having your items authenticated by a well-respected professional autograph authentication company. Some of the trusted sources within the sports memorabilia market include the following companies: PSA, JSA, Tristar, UFC and Mounted Memories. Click on any of the images below to view full size photos. The entire signature is written in cursive. The dominant letters are the "R" and "F."
The "R" is unique in that the loop makes a large "D" shape and it is not connected by the back vertical line that runs on a 45-degree angle. The vertical for the "i", which is dotted, rests below the loop of the "R" is do the "c" which is small with no curve to it, and the "h" which is easily legible. The "F" looks like a large, over-sized question mark who own top portion intersects the loop of the "R."
The remaining letters of the signature are more implied than anything, although the "l" is discernible and the haphazard dot implies an "i."